The Monarch 9403 has been discontinued. No direct replacement is available. The 9403 Printer is the rugged solution to many label and tag printing applications. 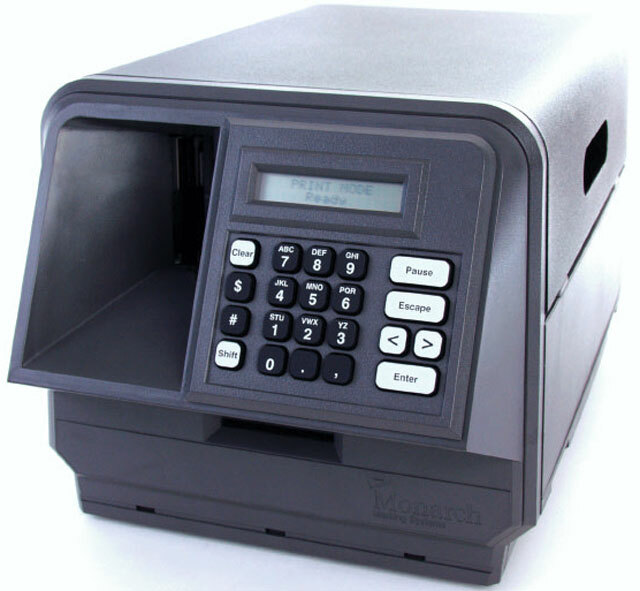 From retail pricemarking to work-in-process labeling this sturdy Printer can handle your barcode marking jobs. And its compact size - 9" high x 10.5" wide x 16.5" long (229 mm high x 254 mm wide x 419 mm long) - lets you use it almost anywhere. The 9403 Printer can be linked to a host computer or to a PC for fast on-line printing. Standalone printing is also an option with up to 16 pre-defined formats. Thermal Labels, 1.2" wide x 1.1" tall white Direct thermal labels for the PathFinder Printer. 515 labels per roll, 50 rolls per case. Priced per case. Thermal Labels, 4" x 6" Thermal transfer Paper Label, Fanfolded, 1,900 labels/stack, 2 stacks/case. Includes 1 roll of 4.33" x 1,968' Wax Ribbon. Priced per kit.